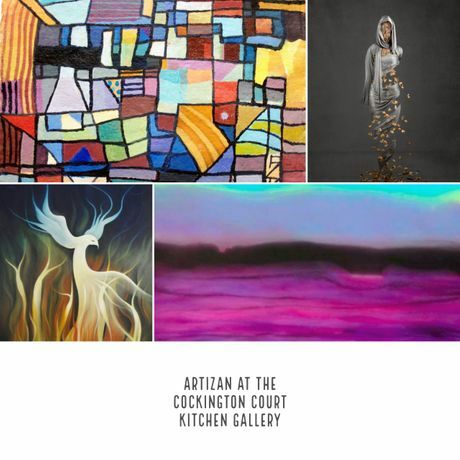 Artizan on Tour: ​"For this external show we will be joined by four Torbay and South Devon artists, all uniquely talented in their own fields." Artizan is privileged to have been invited to exhibit at the Cockington Court Kitchen Gallery with a selection of artists as part of their 2018 series. For this external show we will be joined by four Torbay and South Devon artists, all uniquely talented in their own fields. This gorgeous space is situated at the front of the court overlooking the main green and hosts a range of exciting exhibitions throughout the year including their annual “Pewter Now” show featuring unique and unusual works of local and national pewter artists. Joining us in the space will be: Kirsteen Titchener, a wonderful photographic artist who blurs the lines of reality through skilled photomanipulation and an inspiring imagination; F. G. Davis, a leading contemporary artist known for his pure abstraction and mixed media collage works exhibited internationally; Jo West, the UKs first colour changing resin artist; and Susan Cavaliere, influential Torbay surrealist artist inspired by folklore and mythology. The show runs until the 23rd April during the courts normal hours.